4 For 2 Entire Bundle Of eBooks And Workbooks! Empowering Mums highly acclaimed eBooks and Workbooks have benefitted mums and mumpreneurs for almost ten years now providing inspiration and support with many great mum related topics, tips and solutions to help overcome the daily challenges mums often face on a daily basis! You can purchase a very special 4 For 2 Entire Bundle of Empowering Mums inspirational and extremely popular eBook's & Workbook's for mums. Normally available in our online shop, the entire bundle of four retails at a total of £43.80. You can receive this very special 4 For 2 Entire Bundle for an amazing £29.90 - the equivalent of just two of the eBooks - 'How To Find More Time: For Busy Mums' and 'Decluttering: Clear Your Space, Clear Your Mind' - that's right all four for the price of just two - a WHOPPING 32% Discount! Wowzers, outstanding value for what I'm sure you'll agree are four key challenges many mums struggle with on a daily basis! Imagine your day filled with.. The space and energy to embrace welcoming all you want into the year ahead - clear of clutter in your life, mind, home and business! From the highly positive reviews received from VIP clients and mums purchasing these books, I know how these eBook's and eWorkbook's have transformed the day to day lives of mums who have embraced and implemented these key solutions into their daily lives with all the information, tips, templates and best practice in these highly acclaimed and popular ebooks! Right now you have a golden opportunity to embrace improving all four of these complimentary areas of your life with these popular eBook’s and eWorkbook’s that often feature in our Empower newsletter. Can you imagine the positive impact these solutions will have on your day to day juggling of all your roles and responsibilities! Treat yourself, do something for you that will help you create an easier, happier you in the year ahead - get your special 4 For 2 Entire Bundle TODAY for just £29.90. Wishing you greater confidence, balance and clarity for an easier, happier life and business! '4 For 2' Entire Bundle Of eBooks And Workbooks! Empowering Mums highly acclaimed eBooks and Workbooks have been benefitting mums and mumpreneurs for almost 10 years now, providing inspiration and support with many great mum related topics, tips and solutions to help overcome the obstacles and challenges mums often face on a daily basis! Normally available in our online store, the entire bundle of four retails at a total of £43.80. 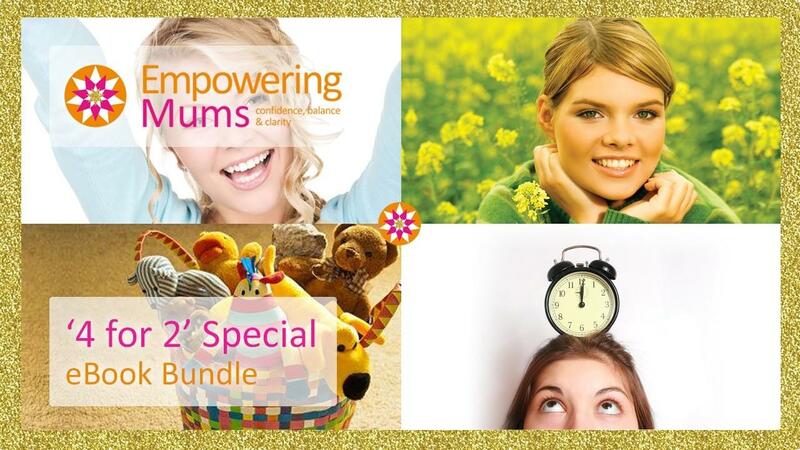 The '4 For 2 Entire Bundle' can be yours today for just £29.90 - that's right all four for the total price of just two of them 'How To Find More Time For Busy Mums' and 'Decluttering: Clear Your Space, Clear Your Mind' - a whopping 32% saving!